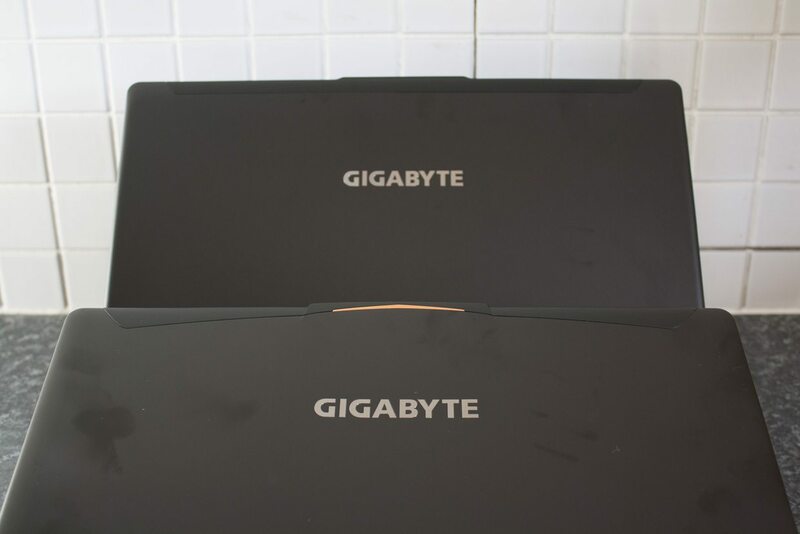 Today we’re doing something a little different — we’re reviewing two laptops at once, as we examine Gigabyte’s P35X and P37X v6. Both models are equipped with 4K screens, Core i7 processors and one of Nvidia’s latest GPUs: the mighty GTX 1070. Backed with the latest tech, these premium laptops should absolutely scream. Let’s put them to the test! 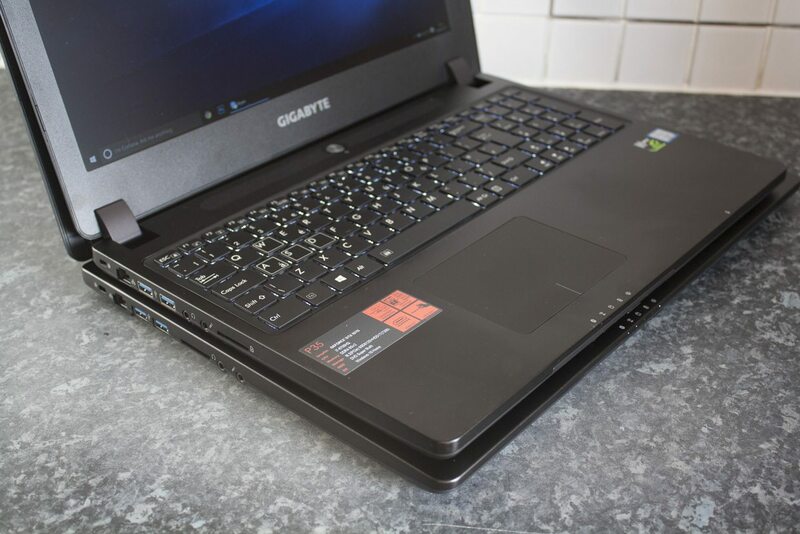 The Gigabyte P35X v6 and P37X v6 are top-notch gaming laptops, boasting tack-sharp 4K displays, excellent GTX-1070-fuelled performance and a mature design. 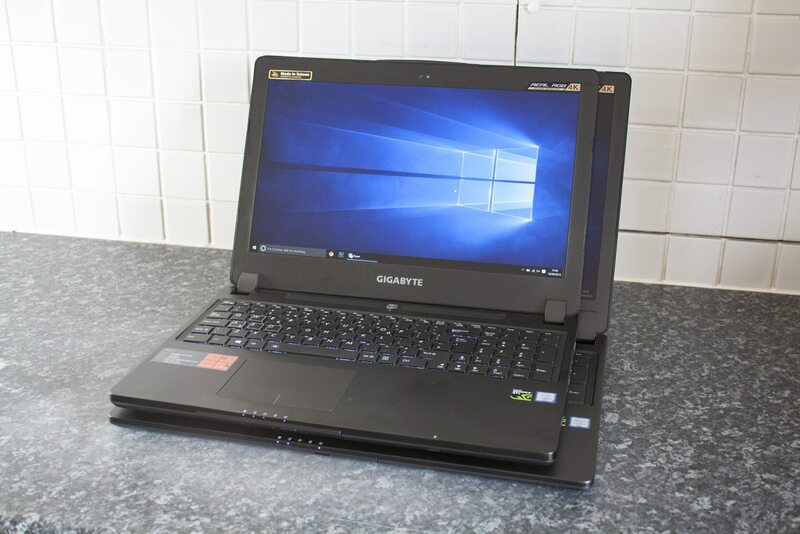 Gigabyte have been iterating on these laptops for years, but they’ve reached spectacular new heights with the latest generation. First, let’s take a look at how these two machines differ — it’s not by much. 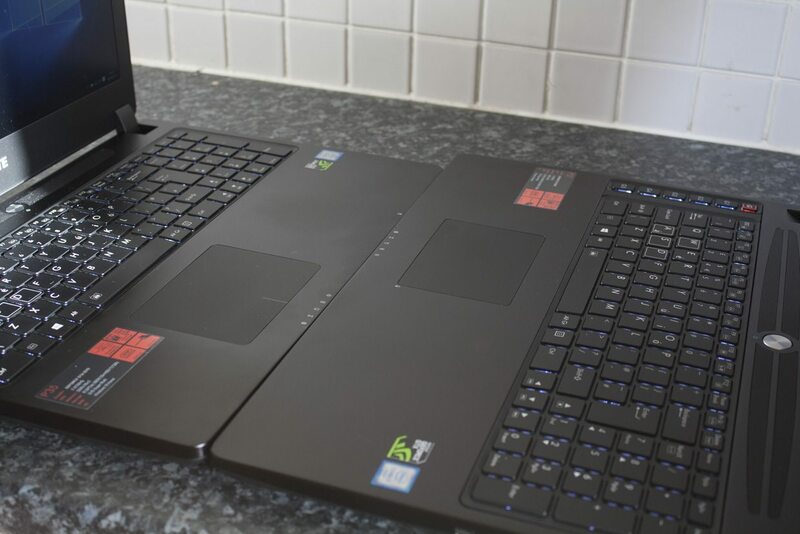 The 15.6-inch P35X is on the left, the 17.3-inch P37X on the right; shared specs span both columns. Gigabyte’s P35X and P37X both see minor changes in their v6 revisions. The P35X has a new orange strip that accentuates the crest of the lid. Otherwise, the design remains unchanged — we have sleek aluminium and plastic bodies, with rounded corners and a fairly subdued look. There’s enough flair that you can tell this isn’t a business laptop, but it’s not as over the top as Acer, Razer or MSI’s offerings — there are no bright red LEDs, no oversized grilles and thumping sound systems. Restraint is the order of the day. The first thing you’ll notice when using these machines is their display. Both have 4K resolutions, 3840 x 2160, Ultra HD. That makes text incredibly crisp at the default 250% scaling, although apps that don’t support the scaling become absolutely miniscule on either screen. The 15.6-inch span of the P35X is slightly more dense, but both look incredible. This is helped by the fact that both use fairly-well calibrated IPS panels, which offer excellent viewing angles and strong colour reproduction. They’re not quite the equal of Apple’s tuned displays in this regard, but they certainly trump them in resolution. Below the display rests the chiclet keyboard, backlit in white and boasting a full layout, including a number pad, half-height function keys and full-size arrow keys. The P37X adds a row of G macro keys to the left hand side. The travel of the keyboard isn’t massive, but it still feels sufficient and is more than capable of sustaining fast and accurate typing. However, for competitive gaming you’d probably want to use a mechanical keyboard for the greater tactile feedback it provides. The trackpad is another highlight, with the surface constructed from a single piece of plastic (no discrete buttons here). It’s not glass like premium models from Apple or Aorus, but it’s wide and easy to use, with support for multi-finger gestures. Trackpads have improved markedly in Windows over the past few years, and the P35X and P37X don’t disappoint in this regard. The trackpad can also be disabled via a key combo to prevent accidental presses, which is ideal if a mouse is being used. Now it’s over to Ross for the Port Report. Ross? Thanks, Will! So for both laptops we have precisely the same port layout. On the left, there’s an SD card reader, two 3.5mm headphone ports — take that, iPhone 7 — and two USB 3.0 ports. There’s also a gigabit ethernet port and a Kensington lock. 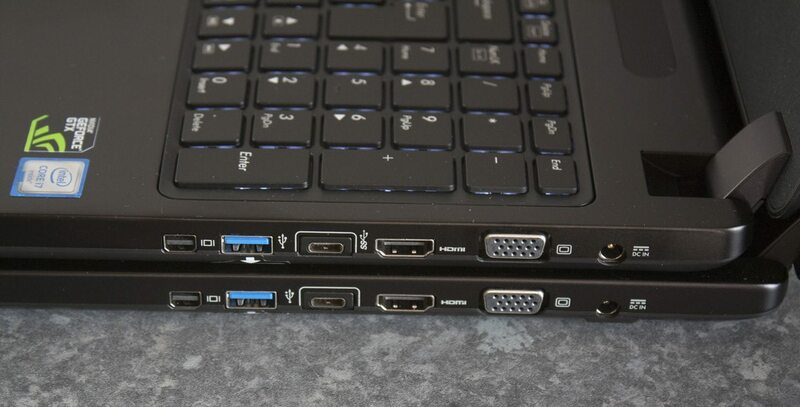 Interestingly, the position of the headphone jacks and SD card reader are reversed between the two laptops. On the right, we have one more USB 3.0 port, a USB 3.1 Type-C port (for all your advanced phones, tablets and laptops), and the display ports: Mini DisplayPort, HDMI 2.0 and (inexplicably) VGA. The power input is also here. All in all, it’s a good layout, although I’d happily trade away the VGA port for another USB 3.0 port — three full-size USB ports is probably as few as you’d want to see on a gaming laptop. Thanks, Ross! So overall the P35X and P37X make a strong first impression, with their well-designed keyboards and trackpads, a good selection of ports and absolutely top-notch displays — all encased in a slim, solid frame. 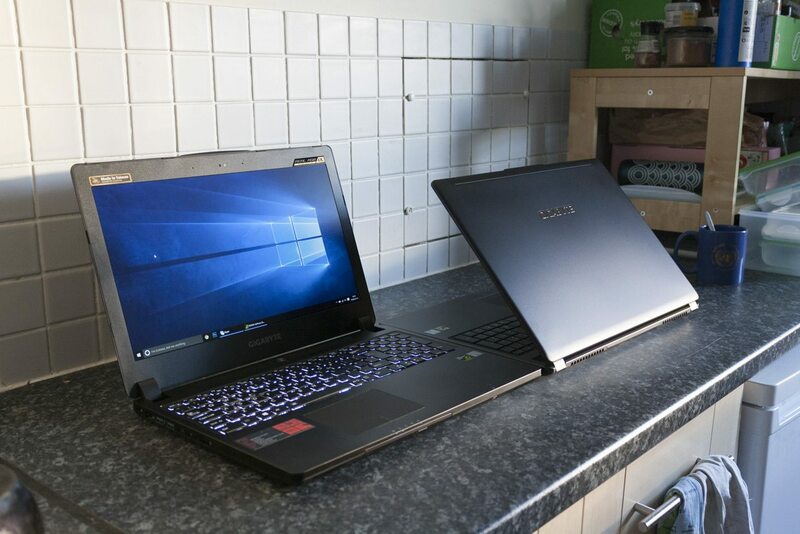 We’ll be looking most closely at how the P35X v6 and P37X v6 compare to each other, as well as the previous generation P35X (the v5 model) and the equally-expensive Aorus X7 v5, which packs two last-generation graphics cards. Other names you’ll expect at the top of the pack are the few gaming desktops we’ve looked at — the Stormforce Inferno and 442, the Acer G6 and even the 1080-toting XSR rig. Let’s get started. The GTX 1070 is a big upgrade over the GTX 970, and that’s reflected in the strength of both laptops’ results in the Fire Strike and Fire Strike Ultra tests. 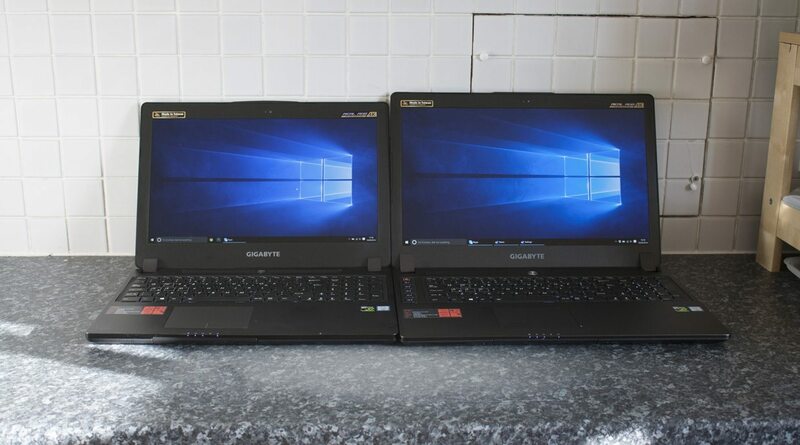 The two Gigabyte laptops scored higher than any other laptop or desktop we’ve ever tested, with the exception of a single £1550 gaming desktop. They beat out a pair of gaming desktops (albeit cheaper ones), a dual-core Aorus laptop, and put the Acer Predator 15 to absolute shame. The P37X shows a small but noticeable advantage over the P35X; this is likely thanks to its larger chassis, which provides slightly better cooling. We also examined performance in the new DX12 Time Spy test. Although we don’t have many other test results here yet, we can say that the P37X got a score of 4916, and the P35X got a score of 4812. By comparison, the Predator 15 scored just 2313. Cinebench examines OpenGL (GPU) and CPU performance in two separate tests. 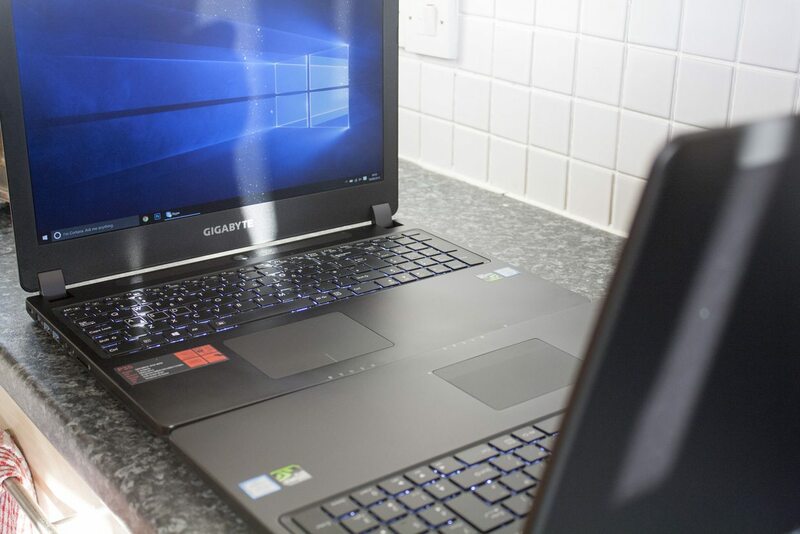 The Gigabyte v6 laptops come more in the centre of the pack here, but sit behind only gaming desktops (the StormForces, the Acer G6) and better-equipped laptops (the dual-GPU Aorus X7, the desktop-CPU-toting XMG U506). GeekBench is up next, which is largely a test of processor and memory performance. As these laptops come with the same i7-6700HQ processor as most other laptops on this list, we’d expect to see largely similar results. True to form, the Gigabyte x6 laptops score just under 13,000 points, very close to other machines with Core i7-6700HQ processors. We’re using version 3.1.3 of this test. GeekBench 4.0 has just been released, and we’ll collect results in the new test and start using them in reviews from 2017. For now, we can say that the P35X / P37X respectively scored 13597 /12815 in the 64-bit multi-core test, and 153,546 / 152,899 in the Compute OpenCL benchmark. CrystalDiskMark tests disk speed performance. The P35X v6 and P37X v6 come with the same Samsung 950 Pro NVMe (PCI-e) drive as their predecessors, and thus command healthy totals around the 1600 MB/s mark for sequential reading and 1200 MB/s for sequential writing. This is bloody quick, and rivals anything we’ve seen from a single drive system. You should face no problems transferring large amounts of data, loading up levels and such. Our first game test is Tom Clancy’s The Division, a cover shooter MMO set in the frozen wastes of post-viral-outbreak NYC. The Gigabyte machines acquit themselves well in this first in-game test, recording stable 70+ fps results at Ultra settings and 1080p. At 4K, the machines were still capable of around 30 fps (for that cinematic console feel), but you’d be best dropping down the detail or the resolution to ensure a fluid result. Despite the inclusion of the GTX 1070, the game remains GPU-limited, particularly at high resolutions like 4K. We may need to bring on the GTX 1080 to truly handle this title at 4K! Bioshock Infinite represents the easiest workload for our test machines, but it’s still important given just how many games of its era use the same Unreal Engine. The Gigabyte machines record scores around 150 frames per second here, about the same as the ridiculously-equipped XMG U506. You could definitely run this game at its native resolution if you wanted to, albeit maybe with a few settings tweaks. Metro Last Light is a much harder workload. Interestingly, the screens of both laptops went black for the duration of the three runs, only returning to life once the results were ready to view. This doesn’t appear to have affected the outcome, but it’s worth mentioning. Both laptops scored 95 fps consistently, although the P35X did face some throttling in its third run and dip 3 fps lower. Company of Heroes 2 has one of the most difficult benchmarks we use, offering a kind of ‘worst case scenario’ rather than something more typical of either the singleplayer campaign or multiplayer. The P35X and P37X just barely miss that golden 60fps mark, but surely hit it in normal gameplay. Indeed, you might want to shoot for a higher resolution than 1080p, or tighten up some of the settings, particularly in the gorgeous (and less stressful) single player modes. We conclude with a look at performance in a large-scale RTS, Total War: Rome 2. The two laptops again score almost identically, just differing by 3 fps at around 100 fps. This is a good result for Ultra / 1080p, beaten only by three gaming desktops and a dual-GPU laptop (the Aorus). We reckon that 4K / High should be more than playable, which sounds like great fun. Overall then, strong results across the board. Most games are GPU-limited these days, and for these games the GTX 1070 delivers awesome performance. Still, 4K and High or Ultra settings may be beyond the reach of even this laptop. To get to grips with the P35X and P37X, we used them for about a week — frantically gaming, writing and Photoshopping. Here are our impressions. Let’s start with the bad stuff, as there’s not much to cover here. Although battery life has been improved somewhat since the last few models, we’re still looking at a usable maximum of about five hours for non-gaming tasks (like writing this review). That’s better than other gaming laptops on the market, but doesn’t challenge the all-day (10~12 hour) figures from non-gaming Ultrabooks. The keyboard is also something of a mixed bag. It feels quite precise, but the slim dimensions of both laptops ensure that it also has minimal travel. It’s not the worst laptop keyboard in the world by any stretch of the imagination, but it could also be improved — I’d be happy to have a slightly thicker laptop with a nicer keyboard. 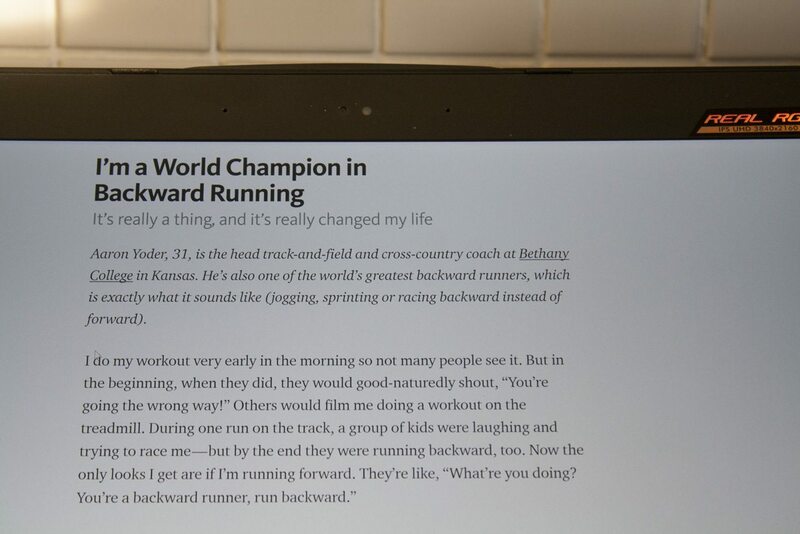 This might be a long section, because there’s a whole lot I like about these laptops. The display is right at the top of that list, as these 4K IPS displays absolutely sing, whether you’re browsing the web or playing games. Text is rendered with absolute clarity, games are breathtaking, and I don’t think I can now willingly move back to just Full HD resolution on a laptop. Of course, running at this resolution does demand a lot of horsepower — and thankfully, the P35X and P37X provide just that. The GTX 1070 copes well even at the native resolution, and demolishes games run at 1920 x 1080. The inclusion of Mini DisplayPort and HDMI 2.0 also means you can connect a high resolution or high refresh rate monitor, too; I’d recommend a 2560 x 1440 / 144 Hz monitor for the best combination of speed and substance. Of course, running a high-end graphics card like the GTX 1070 in a small frame does result in both heat and noise — but it’s not overmuch in either case. You’ll definitely hear this laptop while it’s cranking through the frames, but it’s not deafening. You’ll definitely feel a warm spot on your desk, but throttling seems relatively rare and performance remains strong throughout. The portability of the P35X and even the P37X is top-notch. Going from the heavyset Acer Predator 15 to the P35X feels like a revelation (although of course the Predator is a little more than half the price). The P35X fits easily within standard-size backpacks and larger messenger bags, but you may need something a little larger for the P37X’s increased dimensions. Happily, while the laptops are both fairly large, they are also quite slim, so they don’t take up a lot of space in laptops that do fit them, so you’ll have room for the (similarly large yet slim) power brick and your other belongings. 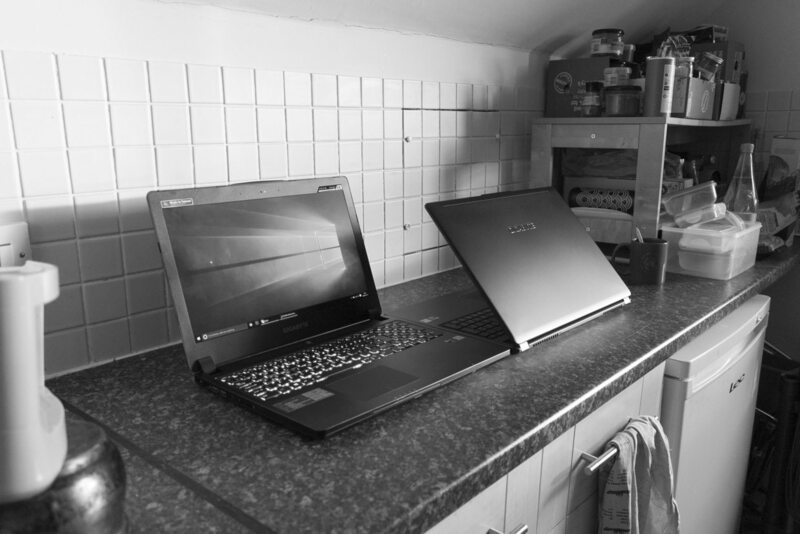 Ultimately, the two laptops mirror each other almost exactly in terms of performance. The P37X’s larger chassis gives it a slight thermal advantage, which translates into a few frames here and there, but it’s not enough to make it the obvious choice. Instead, you should decide based on the form factor — the P37X is more comfortable to use thanks to its larger screen, but the P35X is more portable with its smaller frame. Both are excellent gaming laptops, no doubt. 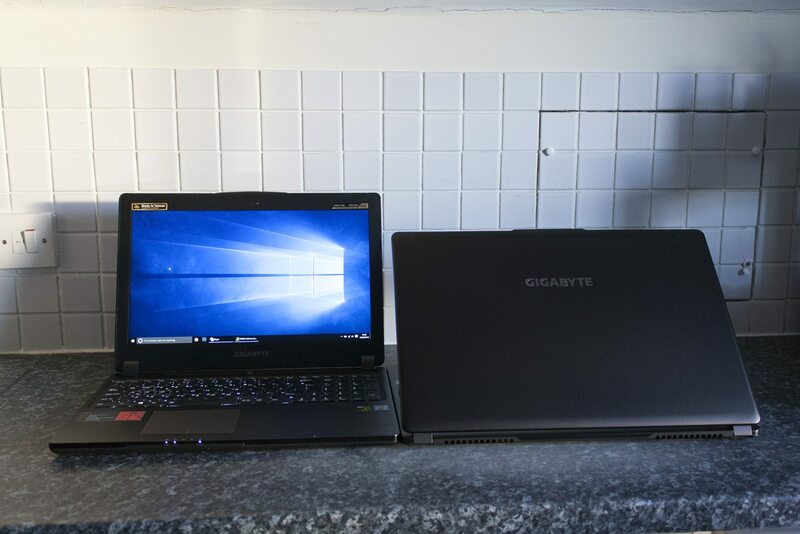 The Gigabyte P35X v6 and P37X v6 are well-crafted super-premium laptops, boasting impressive performance in a very slick package. The inclusion of GTX 1070 GPUs provides a welcome boost to firepower, even though max settings 4K gaming remains out of reach — maybe next generation. Still, the laptops are able to handle all games at 1080p without issue, and can run older titles (or those at lower detail levels) at 4K with playable framerates. The rest of the package is impressive too. A good selection of ports, a tactile (if shallow) keyboard and an accurate trackpad make these machines a pleasure to use. However, the biggest props have to go to these laptops’ displays — browsing the web in 4K is sensational; I don’t want to use anything else ever again. So there you have it — two near-identical laptops offering excellence in performance and design. If you can afford their asking price and understand their limitations, you won’t be disappointed. That’s a shame mate. Perhaps you can import one or get a friend in a different region to buy one for you? does anyone know how many external monitors it can power in addition to its main display?